My goal for this build was to take advantage of all the new overpowered changes to Trickster without playing something that will trivialize the game too much and still keep things interesting. This build is not for those who want to play the best most efficient META-builds out there. It does require the player to be experienced in the game and might even take some time of getting used to playing Charged Dash since it is a vastly different way of playing the game. - Takes some time to get used to, learning curve. - Does not facetank some bosses and end-game bosses do not die in seconds. * Its an increadibly fun skill which has great potential for fast clear speeds. * Tricksters "Weave the Arcane" ascendancy node make the skill free to cast. * Tricksters "Swift Killer" ascendancy node gives us extra Frenzy and Power charges as well as a way of generating them. * Have you ever seen a Charged Dash build that could clear all content in the game? I hadnt so i accepted the challenge. * In short, Trickster is perfect for Charged Dash and the skill is something i really enjoy. You said that Trickster is OP, why is that? And the changes to Swift Killer make the node one of the best DPS ascendancy nodes in the game since it help us constantly keep our Power and Frenzy charges up, give us +1 to both of them and add extra buffs to having the charges. My DPS in PoB seems really low, does this build even work? Charged Dash DPS in PoB is without all the bonuses the different stages of the skill has. We get 150% More damage after the illusion stop moving so if you multiply your dps by 2.5 you get your DPS while just holding down the skill. We also get a big burst when releasing which is at 75% of damage per stack. We get 1 stack per attack and with my current ratio of MS and AS i generally end up at 8-10 stacks depending on how i controll the illusion. That is equal to between 6x and 7.5x dmg. 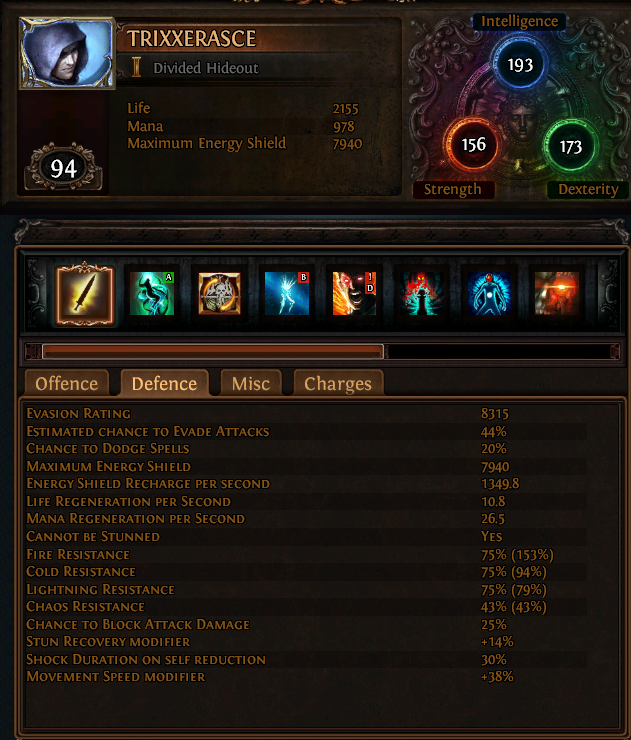 Great original build, hope you manage to kill shaper, will try it in the near future. Did you level all the way with charged dash or do you use any other spell? Killed Shaper already, attempting Uber Elder at the moment. Levelled with Frost Blades up untill i got Charged Dash in Act 3. It takes some getting used to, but with 2 Quicksilver Flasks and OK gear (i used no levelling uniques or such since it was at the start of the league) you can blow through areas really fast since you are basicly "running" with 30% More MS while killing the things you "run" through. You might not 1-shot all the rare monsters so you need to take a few turns back and forth over them. Bosses are pretty damn easy once you get used to how to use the spell correctly, i died a few times to some bosses that i generally dont die to (Brine King) because i actiddentally jumped into damage that i otherwise just avoid. Now after playing Charged Dash for roughly 2 weeks i find that it actually make a lot of boss fights easier - like Shaper. Since you are basicly dodging stuff while damaging them. On top of that i can tank Shapers slam ability without dying due to the damage mitigation from Ghost Dance and high HP pool. I'm going to record me doing some stuff later so i can post some videos of how map clearing and boss fights usually look. Except, no. copied from the other threads on the first page. Could you please point me in the direction of these other builds? If they really are as similar as you claim then i will remove my thread. Was chaos damage an issue for you? Not really, but thats just because i had already identified it as a potential issue when i made the character - so i stacked Chaos Resistance whenever possible. After i killed A10 Kitava i still had something like 20 Chaos res and an Amethyst Flask. I also purposefully use an Imperial Claw for the high life gain on hit. 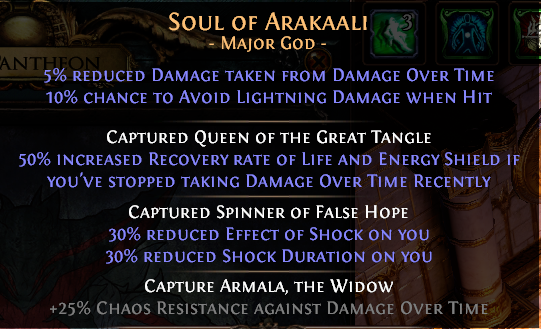 This combined with having Soul of Shakari make chaos damage (mostly) a non-issue. I did have to respecc 2 points to get CI when i killed Pure Chayula. I really enjoy the play style of clear speed builds and charge dash and the two of them combined? Outstanding. Really hope to see some videos update from you.